Gabriel Anderson, Stacie Anderson and Jenna Kniss, senior undergraduate students majoring in sport management at Georgia Southern University Statesboro Campus, were selected by sport management faculty to represent Georgia Southern at the 2019 Applied Sport Management Association (ASMA) Conference Case Study Competition this past February. The conference, held in Nashville, Tennessee, tasked student competitors with identifying a location for the next Major League Soccer (MLS) expansion team, writing a report about their recommendations and presenting their findings to a panel of judges who were identified as experts in the soccer industry. A total of seven teams of undergraduate students from universities across the country presented their findings with Georgia Southern taking second place in the competition. 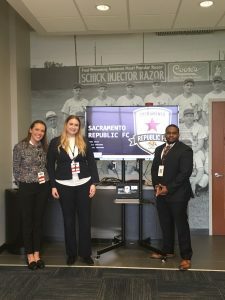 Kniss, a native of Lodi, California, recalled using her knowledge from courses in sport finance, sport marketing and governance of sport organizations to assist her in the competition. In addition to the competition, students were able to visit with alumni, CJ Berthelsen (’15), Zack Taylor (’11) and Michael Schetzel (’94), who are currently employed with the Nashville Sounds, Nashville Predators and Nashville Soccer Club respectively and meet with other leading industry professionals. Both Stacie Anderson, from Millen, Georgia, and Kniss noted one of the things they enjoyed the most about the trip was the opportunity to meet with alumni currently working in the sports industry.